GAINESVILLE, Ga. — Since acquiring the first robot in 2009, surgeons at Northeast Georgia Medical Center (NGMC) have completed more than 1,400 robotic procedures for urological, gynecological and general surgical conditions, including bariatrics. 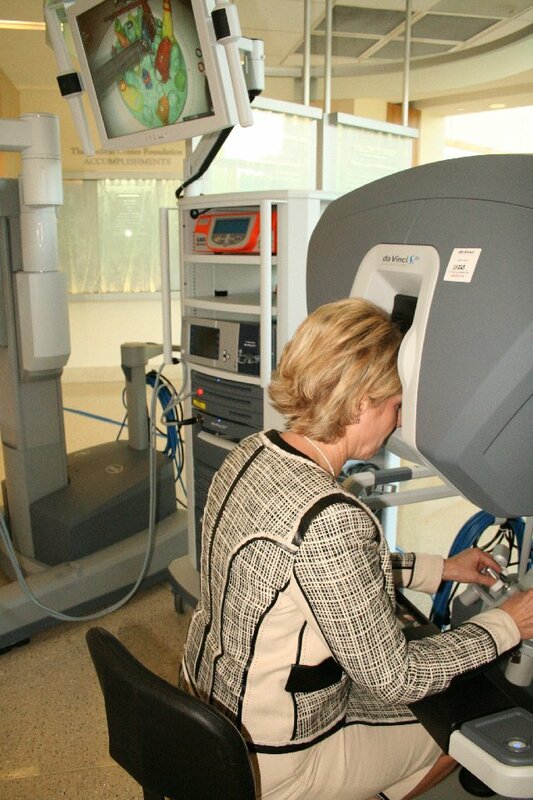 Now NGMC has become one of only two hospitals in Georgia to acquire and utilize two da Vinci Si Surgical System robots outfitted with all the latest advanced technologies. The da Vinci Surgical System allows surgeons to perform delicate and complex operations through tiny incisions with breakthrough vision, precision, dexterity and control. Robotic surgery commonly reduces a patient’s blood loss, pain and recovery time. “For the patient, this means low blood loss, smaller incisions, a shorter hospital stay and a quicker return to normal activities,” says Andrew Green, MD, a gynecologic oncologist with Northeast Georgia Physicians Group Gynecologic Oncology and medical director of the Robotic Surgical Program at NGMC. Surgeons at NGMC are using the da Vinci Surgical System to perform single site surgeries, meaning the surgeries are performed through one port, the patient’s navel, with virtually no scarring. Currently, da Vinci single site surgery can be used for cholecystectomies (gallbladder removal) and hysterectomies. The robotic program at NGMC started with the help of an anonymous gift of $1 million to The Medical Center Foundation, which was used to purchase the first da Vinci Surgical System. This system was recently upgraded with the same software as the newly purchased second robot, providing the most advanced technologies available for patients at NGMC. Employees of NGMC and local educational groups had the chance to test drive the new robot themselves today in the North Patient Tower’s Hall of Honor – an area created to honor and recognize donors who help fund projects through their financial support of The Medical Center Foundation's Healthy Journey campaigns. For more information about robotic procedures offered at Northeast Georgia Medical Center, visit nghs.com/surgery or call 770-219-3840. For more information about The Medical Center Foundation, or to make a donation, visit medicalcenterfoundation.com or call 770-219-8099.